New Issues Poetry & Prose, 9781936970469, 82pp. NADINE SABRA MEYER'S book of poems, The Anatomy Theater, won the National Poetry Seriesand was published by HarperCollins. Her poems have won the New Letters Prize for Poetry, the Meridian Editor's Prize, and a Pushcart Prize. Nadine holds a B.A. from Johns Hopkins University, an M.F.A. from George Mason University and a Ph.D. from the University of Missouri, Columbia. 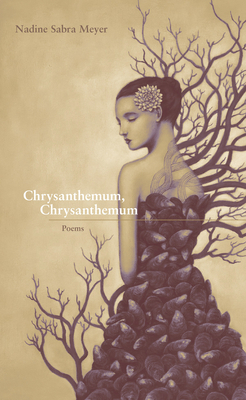 Poems from her new manuscript, Chrysanthemum, Chrysanthemum, have appeared in The Southern Review, Southwest Review, Shenandoah, Literary Imagination, Boulevard, Nimrod, North American Review, storySouth, The Missouri Review, Prairie Schooner, Blackbird, Western Humanities Review and Ploughshares. Nadine is an Associate Professor at Gettysburg College.